Submitted photo Severe thunderstorms have the potential to produce dangerous weather threats such as lightning, tornadoes, straight-line winds, floods and hail. The Ohio Committee for Severe Weather Awareness reports that Ohio’s peek tornado season is generally April through July but tornadoes can happen any time of the year. WRIGHT-PATTERSON AIR FORCE BASE — A severe thunderstorm moved across the area April 3 producing dangerous weather conditions resulting in the activation of a tornado warning and individuals on the installation to take shelter. The National Weather Service has confirmed that four tornadoes touched down in the southwest area of Ohio during the storm. One of those tornadoes was just more than eight miles from Wright-Patterson Air Force Base. As the area continues to transition into the warmer weather seasons, it is essential to stay vigilant for the potential risks of severe thunderstorms and how to respond. Being proactive and preparing ahead of time will eliminate any confusion that could put your safety at risk during a storm. Severe thunderstorms have the potential to produce dangerous weather threats such as lightning, tornadoes, straight-line winds, floods and hail. The Ohio Committee for Severe Weather Awareness reports that Ohio’s peek tornado season is generally April through July but to keep in mind that tornadoes can happen any time of the year. When a tornado warning has been issued, most communities will activate outdoor sirens to alert people to take immediate action. Many communities also offer push alerts through telephone calls or text alerts. The workforce at Wright-Patterson Air Force Base are notified of severe weather through the Wright-Patterson Giant Voice and AtHOC notification system. If a tornado warning is issued, the Giant Voice will activate the siren. The AtHOC system will send watch and warning notifications through e-mail and as pop up alerts on computer screens. Alerts can be set up to send to cellphones and personal e-mail addresses. To personalize alerts, click on the AtHOC icon on your computer and go to ‘my profile’ to update. If a tornado warning is issued, take immediate action and take shelter in your designated location. Do not remain in your work area or get in your vehicle. Remain in the shelter until you are notified that the warning has expired and you are clear to return to your workplace. Be mindful that if a tornado warning is issued, the safety of the Security Forces Defenders on Wright-Patterson Air Force Base is paramount. To ensure their safety, outgoing and incoming lanes at the gates will close so that the installation entry controllers can take shelter while ensuring the security of the base, according to Maj. Aaron Rittgers, 88th Air Force Security Forces commander. If you are in your vehicle during the gate closure, the National Weather Service recommends seeking shelter in a building nearby and wait until an all clear has been issued. If you are not able to make it to a shelter, either get down in your car and cover your head, or leave your car and seek shelter in a low lying area such as a ditch or ravine. Once the all clear has been issued, gates will return to normal operation and travelers can then resume entering and departing the installation. Always stay weather ready and follow your local news to check the weather forecast for the possibility of severe weather. For additional information on weather safety, go to the National Weather Service at www.weather.gov. https://www.fairborndailyherald.com/wp-content/uploads/sites/50/2018/04/web1_180409-F-ME052-001-1.jpgSubmitted photo Severe thunderstorms have the potential to produce dangerous weather threats such as lightning, tornadoes, straight-line winds, floods and hail. 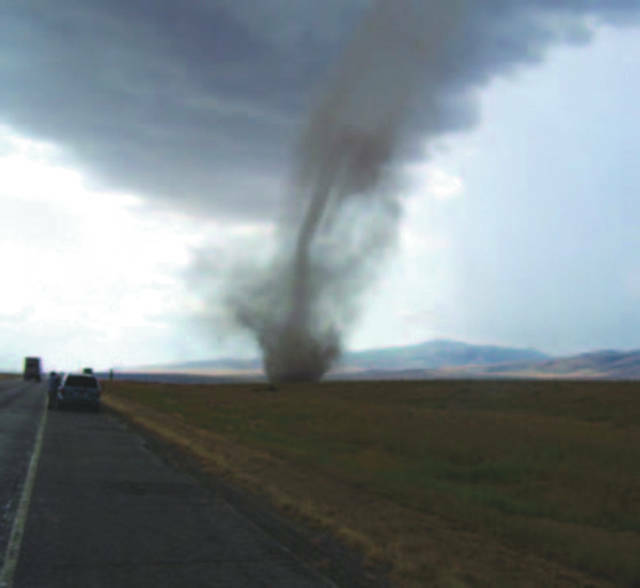 The Ohio Committee for Severe Weather Awareness reports that Ohio’s peek tornado season is generally April through July but tornadoes can happen any time of the year.